As Man City marched ahead to the hopes of starting their run for a possible treble this season, Arsene Wenger had turned his side’s mediocre season around to a cup final. And as Wembley stood witness to the much awaited clash, they were received with a result most of them were expecting. Arsenal were thumped 3-0 by the Sky Blues in a valiant performance, possibly denying Wenger the one domestic success that he failed to achieve in England for good. Goals from Sergio Aguero, Vincent Kompany, and David Silva saw City through the cup tie and on to the Carabao Cup itself. Arsenal lined-up in a back-three after a brief return to their traditional back-four formation. A 3-4-2-1 formation for the Londoners saw them line up with Calum Chambers, Laurent Koscielny and Shkodran Mustafi as the central defenders with the usual pair of Hector Bellerin and Nacho Monreal as wing-backs. Meanwhile, David Ospina continued in goal, as made clear by the gaffer. Aaron Ramsey had returned from injury to accompany Granit Xhaka in central midfield. Pierre-Emerick Aubameyang played ahead of an unusual pair of Mesut Ozil and Jack Wilshere. On the other hand, the league leaders lined up as expected, but not as they might’ve preferred. Raheem Sterling had to sit out the final due to the recent injury he had conceded, and thus, he was replaced by Silva on the right flank. Aguero played his usual No. 9 role with Leroy Sane towards the left of him and Kevin De Bruyne pulling the strings from behind. Fernandinho paired up with Ilkay Gundogan in central midfield, in front of a back-four consisting of Kyle Walker, Nicolas Otamendi, Kompany and Danilo. Claudio Bravo retained his role as the designated first choice goalkeeper in cup ties in what looked like a 4-2-1-3 formation. The game kicked-off and many fans noticed how Ozil was playing from the right wing and Wilshere, who is a natural deep-lying playmaker, was unusually playing as a left winger. But as the game settled in, the German started to drift more centrally when necessary, and Ramsey swapped places with him. The former Bournemouth loanee stayed wide nonetheless. This movement almost earned them a goal, but Aubameyang failed to finish from close range. Nevertheless, the opponents were allowed possession and the game plan seemed likely to have been the idea of capitalising on quick and intricate counter attacks. But as it turned out, the Mancunians didn’t need to do an awful lot of work to exploit this system and pushed through the Gunners’ backline through the left flank. Sane was the key figure during these situations and almost got involved in every move forward from his part of the pitch. From then on, Guardiola’s game plan was fairly simple, as his side maintained possession very well, and managed to thread some very dangerous passes. The North Londoners seemed to have no reply to Sane’s constant knocking, and Bellerin completely failed to keep up with him. Silva also started to drift centrally, which sometimes caused Aguero to drift wide in order to make space. However, the first goal was the result of the Argentine brilliantly exploiting his opponent’s weakness – the gap between Mustafi and Koscielny. It has been becoming increasing common, a situation where the defenders seem to have no communication or awareness. And as common as that situation is, so is a goal that follows, which in fact was assisted by Bravo. Aguero made no mistake from the area and chipped the ball over the Arsenal keeper who was caught in no man’s land. More of that continued till the half-time whistle blew, with the Cityzens having enjoyed 58% of the possession and more than twice the shots as the Emirates outfit. A thorough half-time talk was expected from Wenger in the dressing room and that’s probably what happened, but clearly it failed to reflect on the pitch. Ozil was isolated and completely nullified due to being out of position and also due to Danilo, who remarkably kept him quiet. Either side seemed to have decided on continuing the same tactics and game plan as the first half. And though Wenger’s men tried to get one back, City’s defence was too rigid to allow that. So much so that a brilliant early ball into the path of Aubameyang would’ve almost definitely turned into the equaliser if not for interventions of the City skipper. The Mancunian outfit continued to enjoy possession and disallowed their opponents from taking a single shot for a combined 40 minutes straight since the first half. And since the former Barcelona boss was well aware of Arsenal’s defensive weaknesses, immense pressure was concentrated on the defenders and numerous corners were forced. One such corner led to Kompany’s goal that doubled his side’s lead. Yet again, the lack of awareness from the defensive pair of Gunners resulted in a second stab. Despite the two-goal cushion, the Etihad outfit kept pushing forward, especially through the left flank, where Bellerin was having one the worst games of his career. Danilo, who had been rather quiet in the first half, had also started to support the wingers and get into advanced positions. And as many would’ve guessed, that’s exactly how Silva scored the winner- via a pin-point pass from the Brazilian, who was surging forward as the rest of the players kept the pressure on. Chambers failed to make a challenge and the net rippled from the impact of the ball that had left the Spaniard’s feet. But as much as the Frenchman tried to get something out of the tie with substitutions, none really worked out fairly well before the whistle blew for full-time. At the end of the day, even the Gooners would admit they were outclassed by some simple tactics and the clinical nature of the Citizens. With 56% possession and 12 attempts, it’s fair to say that the champions dominated the match and deservedly won it. 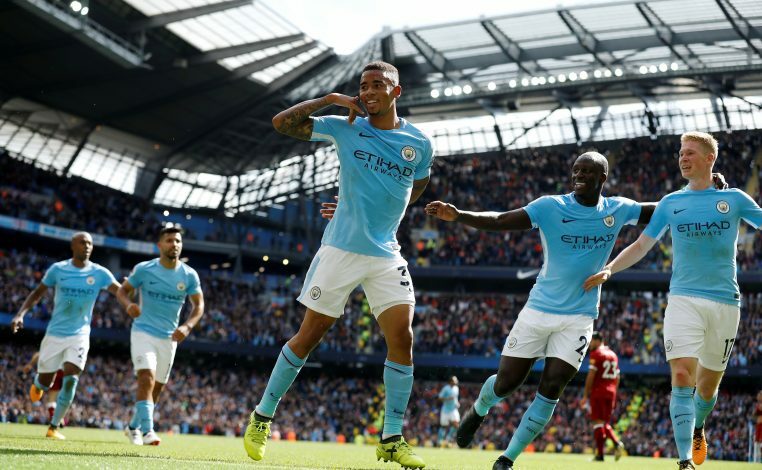 City would now shift their focus on aiming for a treble to make this season truly special. Whereas the London giants only have the hope of Europa League to save their disaster of a campaign.